Sunday I loaded up the car with several decades of old computers, monitors and printer cartridges because I had read online about a monthly Pasadena City College FREE Electronic Waste Collection Event. NOT! I guess you can't believe everything you read on the Internet. At the last moment another, better site steered me to a place that would take my useless electronics (but not the cartridges). Luckily I did not have to unload all that crap back into the garage. And I can feel better because, supposedly, it will get recycled. Also on Sunday the city of Pasadena's ban on plastic bags at grocery stores kicked in. It's amazing how charging me an insignificant dime for a paper bag can change my behavior more quickly than years of appeals to my sense of environmental responsibility. But that's just me. You're probably a better person than I am. I looked up the text of the law to find out who gets the dime. I learned that a reusable bag must be capable "of carrying a minimum of 22 pounds 125 times over a distance of at least 175 feet." 21,875 feet is over four miles total. The bag ban is is the perfect excuse to post this cool picture. It does make you wonder what other interesting uses people might find for those evil plastic bags. The photographer is Henrik Kerstens. Check out his other pictures of the same woman wearing various modern artifacts repurposed as Renaissance headgear. Definite cleverness. Compare the plastic bag hat to the one worn by a young lady in this painting by Barthel Bruyn done nearly 500 years ago. I guess that such a hat would be called a wimple. Click here for lots of pictures of medieval wimples. 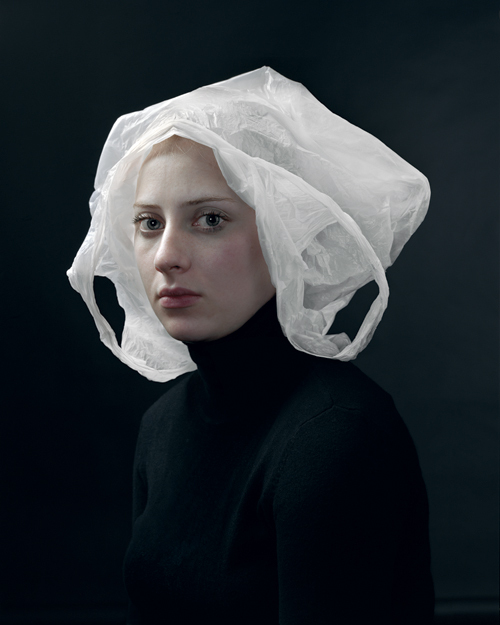 Do you need instructions for making a bonnet out of a bunch of plastic bags? Other stuff, including a bass guitar, made from plastic bags. 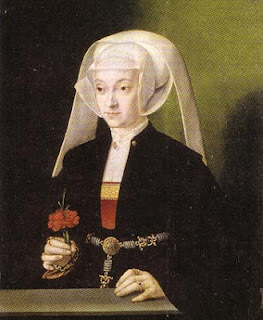 A previous Mixed Meters post about women's clothing in Elizabethan England. Also dog penises. Wimple Tags: plastic bags. . . laws. . . recycling. . . Henrik Kerstens. . . Thank you for that chuckle.